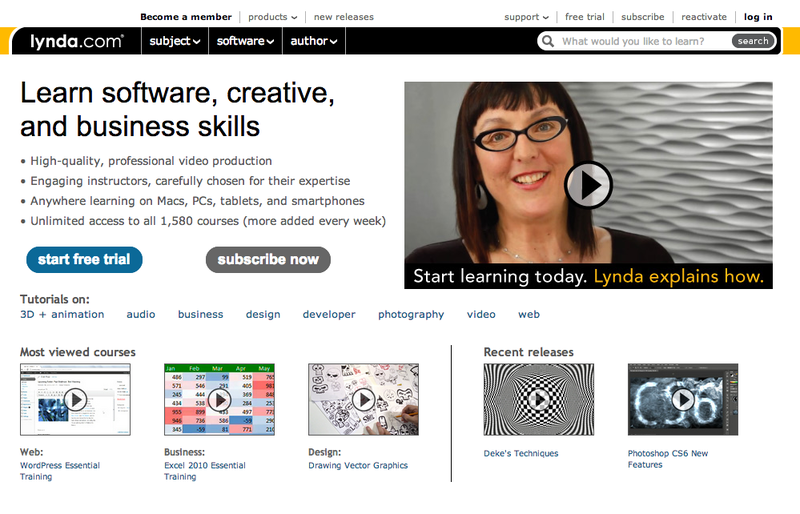 Back in May, we shared the unique story of Lynda.com, the veteran, video-based education platform, and how it was able to generate $70 million in revenue in 2011 without taking a penny from outside investors. Since then, it’s continued chugging along, growing revenue to $100 million in 2012. Founded in 1995 by husband-and-wife team Bruce Heavin and Lynda Weinman, Lynda.com is not your typical tech startup. Compared to its competition, the company is ancient. Not only that, but it’s avoided venture capital, is still led by its happily married co-founders, is subscription based, has been profitable since 1997 and is headquartered in a small town in Southern California — not in Silicon Valley, New York or Los Angeles. Part of the reason for this is the advantage of being a first mover, as the company started building its library of educational, how-to videos long before YouTube, Khan Academy or the Courseras of the world entered the picture. Today, its library counts over 83,000 videos. By creating professional-quality video courses taught by bona fide industry experts, working professionals and veteran teachers — and by offering full access for $25/month — Lynda.com has been able to attract over two million paying users along with corporate customers, like Sony, Pixar, Disney, Time Warner and HBO, which use it to supplement their corporate learning programs. Thanks to its simple, yet effective model and the increasing popularity of online education, the company has seen its growth accelerate exponentially over the last two years. Looking to capitalize on the opportunity, the founders hired PopCap CTO and long-time Adobe exec Frits Habermann as CTO in December to help develop its mobile strategy and lead its expansion into international markets. Last week, it followed with the addition of former Saba Software CFO and Gaia Online COO, Elaine Kitagawa, as its new CFO earlier this month. With its senior leadership in place, the company has finally decided to give in to long-standing interest from investors, announcing today that it has raised $103 million in growth equity from Accel Partners and Spectrum Equity, with contributions from Meritech Capital Partners. The financing, which is the company’s first outside investment in its 17-year history, sees Andrew Braccia of Accel and Vic Parker of Spectrum joining the company’s board of directors. To put this in perspective, Pinterest raised $100 million in May. For the leadership team, that starts with expanding its course catalog. From the beginning, the company has focused on technical content, providing instructional videos on how to use Adobe, Microsoft and Apple’s most popular products — on subjects that ranged from Web Design to Introduction to Excel. In May, for example, the platform published its 500th course on Adobe. But lately, the company has been expanding into more business content, offering courses on how to negotiate or optimize time management and has moved more aggressively into mobile design and programming, with a strong footing in iOS development. Yet, with its sizable new chunk of funding, the company’s biggest growth potential lies in international markets. As of now, Lynda.com’s content is English-only, so going forward, it will be investing heavily in diversifying and localizing its existing content and potentially adding a handful of international studios to the 20-odd video studios it operates in the U.S.
Operating its own production and studios is more capital intensive, but it also assures a higher quality presentation of its content, which in turn appeals to the teachers and experts who help create that content. In turn, when many online video platforms don’t compensate educators or rely on set-your-own-price marketplaces, Lynda has found success in an old model. Once teachers and experts are vetted, they get an advance for their work, meaning that they have a guaranteed paycheck. They can then supplement that base pay with a share of the revenue generated by their content based on the video’s popularity. Ultimately, it’s proven to be an attractive model to teachers, as nearly 20 percent of its 250 educators earn their entire annual income from Lynda.com. While Lynda.com is now reaping the rewards of these models, it’s taken a long time to get to where it is today. And therein lies an important lesson for this new generation of education-focused entrepreneurs: Building a billion dollar education business doesn’t happen overnight, it happens over decades. As technology changes — and education along with it — whoever helps people navigate these new territories most effectively holds the keys to a huge educational market.